Pollett’s Cove had been on our list for years but we’d never managed to make the trip. This part of Nova Scotia is remote and rugged and has spectacular highland terrain that is not found anywhere else in the province. Despite its beauty, we were deterred by reports that the area was becoming overused and at times felt more like a field of manure from all the horses and humans and occasional moose that pass through. In addition, we know at least 4 people who have had tents damaged or destroyed by curious horses. 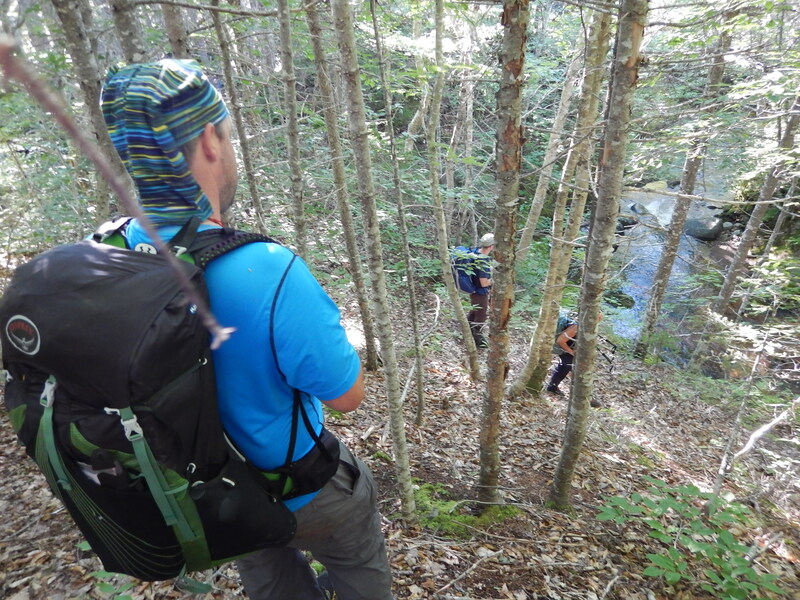 We thought we’d eventually just make it a day hike, but getting to Cape Breton never quite fit into the schedule. 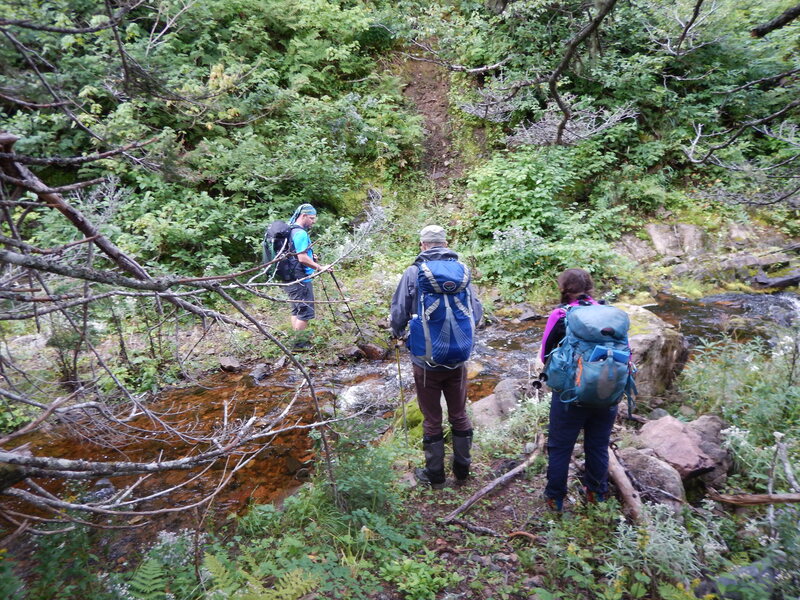 Many of our friends had also made the off-trail trek from Meat Cove to Pollett’s Cove. Although we were intrigued by the challenge (and the views! ), we still weren’t keen to camp at Pollett’s. That was, until Wade and Mark were browsing though the 1975 edition of Hiking Trails of Nova Scotia and came up with a great plan. We would hike from Meat Cove to Pollett’s Cove and then continue inland to Cape North (sort of an L-shaped route). We’d time the trip so that we would (ideally) arrive in Pollett’s Cove for an early supper, but then head inland to find a place to camp away from most of the action. Most of the trip would take place in the Pollett’s Cove – Aspy Fault Wilderness Area. The area where people camp at Pollett’s is privately owned but thankfully remains open to public access. It’s actually an interesting story, outlined in part here. This trip came together relatively last minute. We only had a few days, so knew we’d have to miss out on the spectacular coastal views to take a more direct route from Meat Cove to Pollett’s Cove. Finding suitable tent spots can be a challenge, so we kept the group small, with just Mark and Ellen joining us. This would be a “one-way” hike and after trying unsuccessfully to find a local shuttle, we decided to take two cars. The lovely people at Oakwood Manor Bed and Breakfast generously offered us parking for one car (apparently they had been in business for 42 years at that time, and have since decided to close their doors). We dropped off a car on Friday afternoon and made the 30 minute drive to the Meat Cove Campground, where we were allowed to leave the second car for the weekend. It was cold, windy, and damp as we set out on Friday evening. Oh, and did we mention that the area had received 30-40mm of rain the previous night? We knew we’d get wet… it was only a matter of when. The plan was to hike out of Meat Cove on an ATV trail and find a place to camp just beyond the end of the trail, on the plateau. This way we’d hopefully be in good shape to push on to Pollett’s Cove on Saturday. We made it up the hill without too much trouble, but then the trail pretty much disappeared under water. In what we all knew was a futile effort, we decided to try and circle around to see if we could keep our feet dry a bit longer. We only succeeded in delaying our eventual arrival into camp. We did manage to find a nice sheltered location with enough room for the 3 tents and some trees suitable to hang our food, just as the sun was setting. This was the much-anticipated day, after hearing for years how rough this trek is. Because we stayed inland in a fairly straight line toward Pollett’s Cove we mostly found level ground and rolling hills, and nothing like the elevation change along the more coastal routes described by our friends. 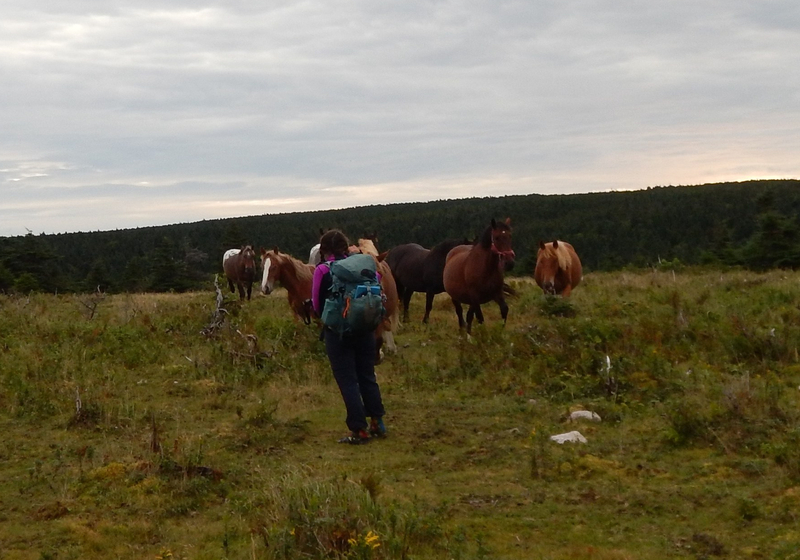 We started out on a long plateau where we were greeted by a large group of horses. The followed us for a bit, but eventually lost interest after a bit of encouragement. Though the route was flat, there were plenty of alder bogs. It was actually a pleasant surprise that these were fairly easy navigating. 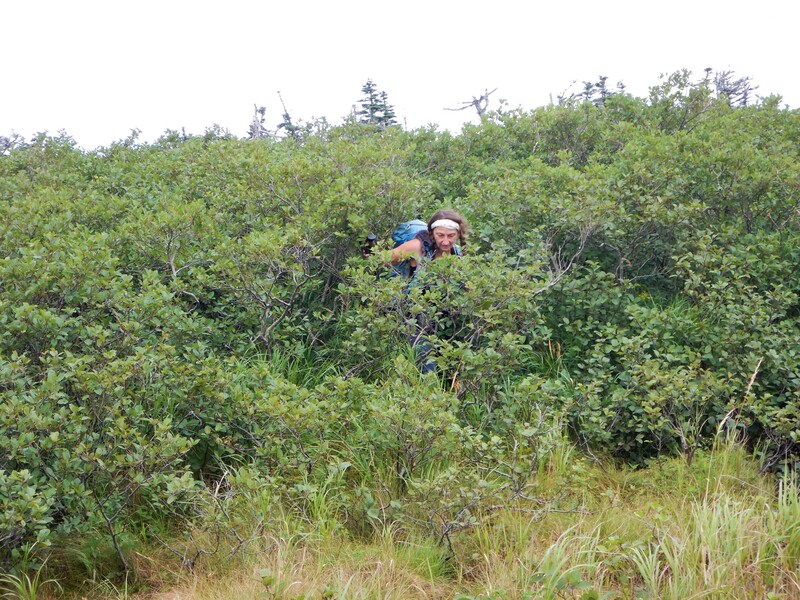 Since we didn’t mind wet feet, we could often walk easily right along the edge of the bogs, or push through the middle where the alders were spaced far enough apart. Between the bogs and streams were many open flat areas with tall grass, deadfalls, and many hidden fallen trees. These areas were actually often the hardest to cross because of all the stepping up and over deadfalls. Despite all of the rain the night before we set out, it had been a very dry summer overall so the conditions were about as good as they could be. We were very pleasantly surprised by how few bugs there were. 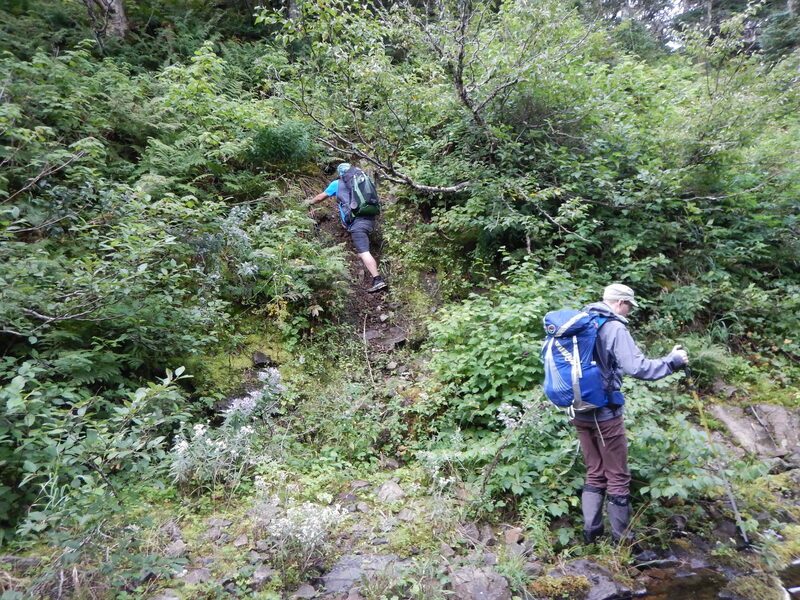 Because we were so far inland, the terrain was mostly repetitive periods of the grassy with hidden deadfalls, alder bogs, and brief descents to cross river beds. A few were steep, but short with no significant elevation change. We were fairly sure there were animals all around us, but there were four of us and a tail-wind most of the way, so any bears or moose that we might have seen had the chance to make themselves scarce. We eventually reached the open plateaus above Pollett’s Cove with expansive ocean views. Once we were close we could see tents set up below, and more hikers approaching from Red River. We knew there would be familiar faces since there was a Meetup group there for the weekend. After some debate about what would be the best route, we carefully picked our way down and joined the mass of campers and horses. We’d made it in time to cook a hot supper and let our waterlogged feet get some fresh air while we chatted with friends. After supper, we headed inland to find a place to camp. We walked for about an hour as the animal trails and manure piles were slow to thin out, but we eventually set up camp in the far end of a large grassy area that held the most promise for a bear hang. We were worried we could only get the food barely high enough, but we didn’t hear or see any animals overnight and our food was undisturbed in the morning. After a quick breakfast we headed out. It was a bit of a guessing game to find the best route but we made good progress. There was one easy river crossing and after that walking along the edge of the river was spectacularly beautiful. At one point we came around a corner to see two moose standing on the other side of the water. They wandered off as soon as they caught sight of us. Those were the only moose that we actually saw on this trip. Shortly before the spot where we had intended to climb up to the plateau, we were drawn upwards by beautiful open forest with low lush greenery that looked like it would make incredibly easy walking. And it was… for about 90% of the way up until it became cliff-like and almost impassable just before the top. Luckily there were trees and roots to climb, we eventually made it up the last few meters! (We would not attempt this particular section again though). As we pulled ourselves over the edge, we could see a tall grassy plateau stretching almost as far as the eye could see. The landscape was punctuated with dead trees and short scrubby tuckamore. Behind us, we could see across the river valley to the plateau on the other side. Off to the left we could actually see all the way back to Pollett’s Cove with a patch of blue ocean visible behind it. It was incredible. We sat down for a snack and decided to dry out our tents which were damp from the morning’s dew. Once we started walking, we found more of the hidden deadfalls, but overall it was incredibly easy going through the tall grass. The deadfalls were odd though, since they were rather large logs for an area void of trees. 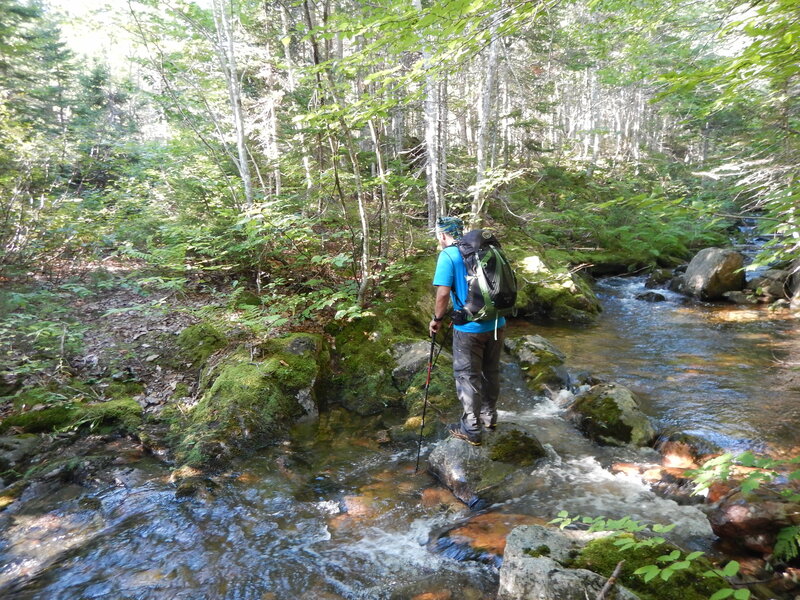 It was fairly easy navigating, and the only challenge was finding more water on the way across, as most of the wet areas were pretty boggy and stagnant. We had planned out the route to include specific passages through the valleys. We began to see flagging tape as we approached the Cape North side, and wondered if this was evidence of scouting for the ambitious Seawall Trail project. As the day was winding down we were walking through field upon field of short tuckamore that were not particularly suitable for camping. The only semi-open spaces were animal-sized and we assumed these were moose beds. However it eventually became clear that it would be a moose bed or nothing. We finally decided to pitch our tents in a particularly scenic area, shovel the moose poop out of our vestibule area, and take our chances. We managed to find a good bear hang for a place where there were very few trees. The hang included one tall tree, one tree climb, and a goofy creative triangular setup involving shrubs. As we sat down to make a late supper the temperature plummeted and we were quick to add layers. At dusk we were treated to the most amazing sunset. We were all pretty tired and didn’t hear if any moose came looking overnight. We knew it would be a long day getting back to Halifax, so we planned to wake at dawn. Sitting in the same spot we had supper, we were unexpectedly treated to an equally amazing sunrise – it seemed we’d ended up in the perfect place to camp! 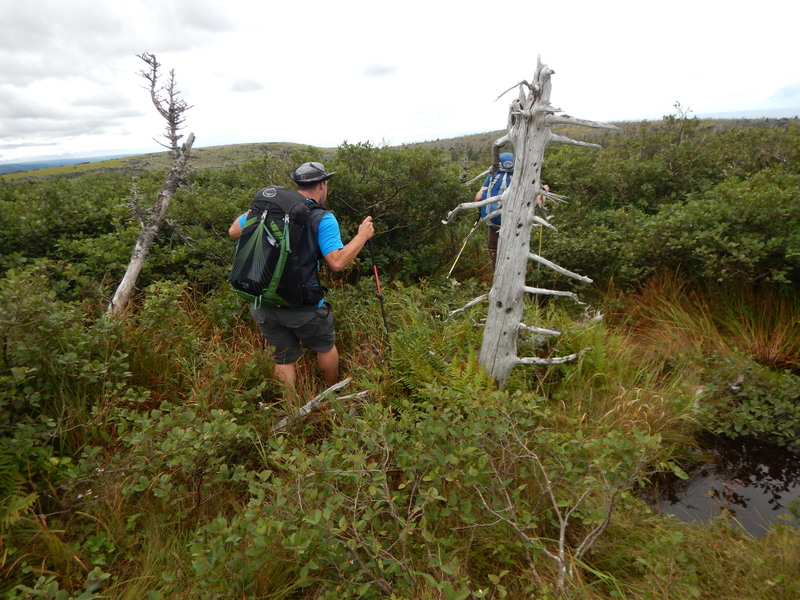 We started out following a moose path which closely mimicked our intended route along the top of the plateau. We lost the trail at the first steep descent, which brought us to a knoll that we had chosen as the best approach to Cape North. From there, it was steeper but more dense with lots of handholds/sliding until we reached the river crossing that would mark where we hoped to pick up a cart path. This went according to plan, and we came out to the main road pretty close to the bed and breakfast. All in all, a success! We had enough time to drive back to Meat Cove to pick up the second car before lunch. 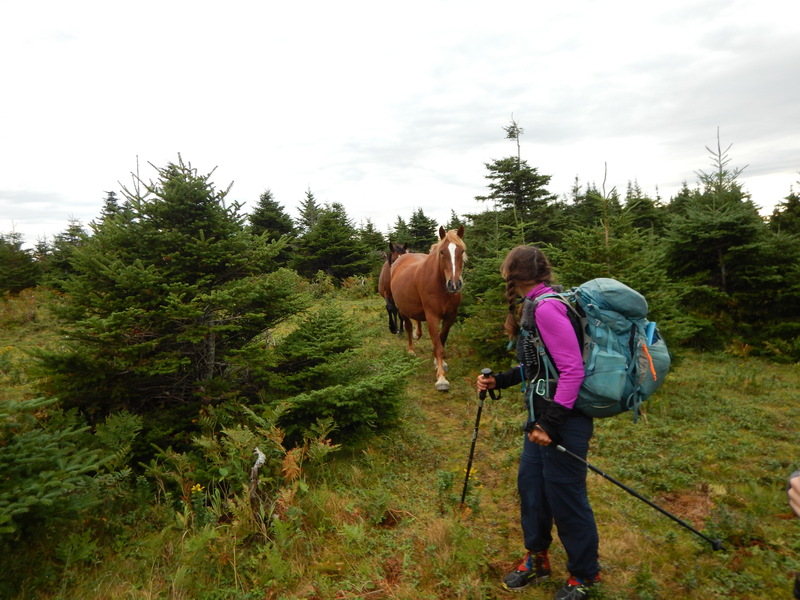 For Heather, the highlight was finally making it into the Cape Breton highlands and experiencing the highland terrain that does not exist anywhere else in the province. The alder bogs were a pleasant surprise, after expecting the worst. The only real low was not having more time to explore the coastal route out of Meat Cove, especially Lowland Cove.